Follow Gary as he shares poetry from Mainers of all backgrounds. 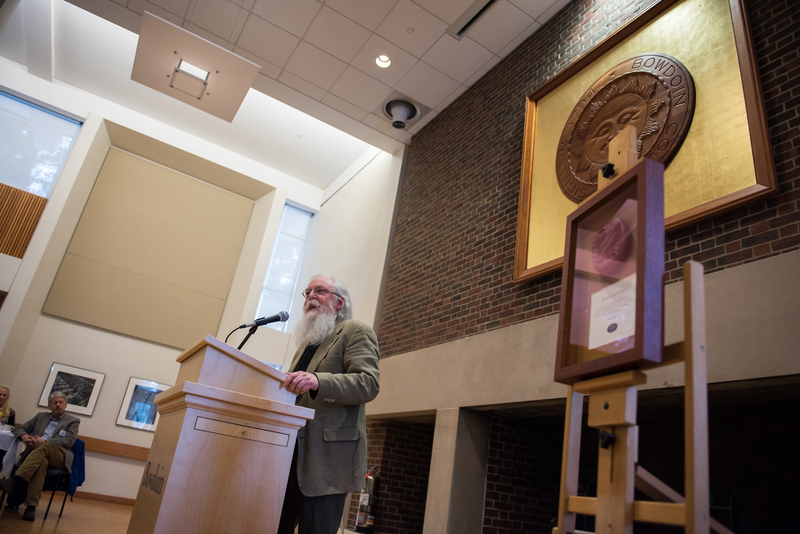 Gary Lawless, who was awarded the 2017 Constance H. Carlson Public Humanities Prize, has long worked to bring poetry and the creative process to the people of Maine. Follow Gary as he shares poetry from Mainers of all backgrounds. Poems will be released monthly in Notes from an Open Book, the MHC’s e-newsletter, and collected below. Sitting with plants the air begins to change. & the toilet bowl fills. the leaves are laid on him. It’s much quieter now. Boulders lie peacefully. A gentle wash of slate litters the hillside. Tree roots caress granite outcrops like old lovers, while igneous and metamorphic sleep together in erratic lineage, allowing lichen decades to creep across their backs. Lumpy ridges, glacial till dotted with ponds and marshes, eroded roots of volcanic chains — permeable or impermeable, but all waiting for exactly nothing. Dappled across each individual stone, and together spread out in pattern, speckled tableau, three shades of gray, maybe a pink, some brown or tan—dappled memory. Throw them farther, farther, each satisfying plunk or plink its own music, song of boys and the bored, the nervous conversation, the rocky frustration. Throw another stone, a composition complete and pleasing. What stories laid here, this northern wall fitted to keep out or in some something, or maybe just to get the damn things out of the way, or maybe no stories at all, only the stony work of hard silence. Go deep enough, you run into a stone. We didn’t have stones there. Florida sand, coral reef, coquina rock, limestone not too far beneath the surface: porous, all porous. Something was missing. So basic. So useful. So often in the way. Every spring a new crop, winter gifts, glacial rubble, tumble and heave. ruts my feet have worn. into the sockets of my hips. What body doesn’t hide secrets from itself? to take the wolf’s heart in its mouth. as we say “I feel cold” you say “I am cold”. I became homeless among them. she doesn’t know how it hurts her son. That moment you need just a cup of survey. Until I landed here homeless but not hopeless. their eyes, wide and wary. chairs and beds don’t fit. they can’t live in a house. only on the coldest nights. Once inside, they start to pace. no roof on your mind. Nothing between you and the sky. Nothing between you and the dirt. your final bed won’t be much different. I would be Stevie Wonder. and his whole body is all black. That’s a real nice song. I’d like to read his mind. as a horse runs across a stream. That wasn’t the first time. to see if they’d make me fart. Come out and see the elephant! my fat Indian aunt said. The big rock that was in my way between Iraq and the U.S. The hardest thing was leaving her behind. in a little tin smelt shack. the bottom and stagger the lines. Try one six feet below the ice. the old fish hag cackled. our way out onto the ice. with dry white pine and beech. wrapped neatly around wooden pegs. with hundreds of squirming legs. “Smelts! Smelts on! Smelts on! followed by hoots and yelps…. breakup of a tilting earth. and paint it blue and white. open them and see better. with a little bit of milk. and have you take it easy. and wear a straw dress. Get married! Get married to your honey. a singer like Texas Red or Johnny Cash. We give you a red rose. out to Isle au Haut. I want to be a junky and a dope addict. beat my children and my wife. in the park for twenty bucks or crack cocaine. and be a burden to my fellow man. so I can buy some beer. and have young punks call me a bum. and puke and piss my pants. and smoke cigarettes that I find. and be shunned by so-called gentlemen. and grow to hate my fellow man. for the things that I’ve become. a vagrant and a bum. killed by the hero of the town. Mike Hicks is a poet and artist, now living in the Pacific Northwest. I’m one of your veteran sons. but my wounds still bleed. but rage on in my head. 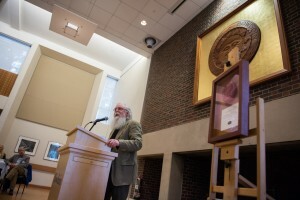 Terry Grasse is a visual artist, poet, and a veteran of the Vietnam War. He lives in Lisbon Falls, Maine. Nantucket, Okinawa, Venice, & Boston. spent his youth on military transport. No, hard as Hell to fathom that. earth comes strangely to mind. The longing there. In the distinction. Thoreau steps in as a guide back home. whale once,” said Old John Neptune. along, & his migration all the way up to the forests of Maine. & guiding me back to Port. beside the good river, rocky at its mouth. Old Meductic Fort, traceless memorial. on the shores of Wolastoq. The naming taken, baptized in ink and parchment. the Old Meductic Trail; the water road. A signpost, our chalcedony flesh. where a girl became a woman. Her body craves the past. eroded year by year with forgetting. Remember Meductic and the Water Road. silent, among water lilies and pickerel grass. It’s quiet in Darfur. It’s not the silence of peace, but it’s the silence of death. ground waiting for the wind to blow them to their final destination. My sisters that once had chances to be future leaders are now afraid to see the sun. So I speak for them. I speak for the thousand girls who want to speak but don’t have a voice. I speak for the thousand children of Darfur because they can only speak in silence. I speak so they can be heard. Because I feel their pain. So I will speak so they can be heard. Don’t step on me, else you will trip. Populus grandidentata, Pinus strobus, Quercus prinus. seem to grasp this tongue. in the secrets it hoards. Kifah Abdulla is a poet and artist living in Portland, Maine. Originally from Iraq, he served in the Iran-Iraq war and was a prisoner of war for over eight years. This poem comes from that experience. It is reprinted with permission from his book of poems: Dead Still Dream. I would like to learn to read. I know one thing I can’t do. Read. It’s hard for me when I can’t read. What would I do if I got lost? I wouldn’t know where I am. I wouldn’t know what street I was on. so I can read signs. I could read a newspaper. Read a book, read the Bible. Read a cookbook, recipes in a cookbook. I could put the right things in the recipe. Tell what size my clothes are. What size shoes I wanted. I could find out when the movies are.